A few days ago, we talked about the Robo-Mate exoskeleton developed by Fraunhofer IAO research institute for industrial usages. Well it seems, another company has kept up with such grand notions of human-synthetic fusion in hard factory conditions. We are talking about electronic giant Panasonic, and how their subsidiary company ActiveLink has been developing an advanced exoskeleton system tailored to factory workers. Christened as the Powerloader (yes, named after the famed Caterpillar P-5000 Powered Work Loader from the ‘Alien’ films), this 13-lb weighing contraption is touted to aid the average user to carry an additional load of 33 lbs. Now in terms of design, this Powerloader exoskeleton is envisioned more as a physical extension of the person, as opposed to just a wearable suit. The consequent working scope entails the amplification of the force input of the user via its 22 incorporated motors. This is accompanied by an array of sensors that can detect the motional scope of the user. So, as the person moves, the ‘suit’ tries to replicate this motion pattern, thus giving a complementary support to the user (along with feedback). When translated to an actual scenario, the Powerloader (with its fully decked out components) was found to allow the user to run at a substantial speed of 7.5 miles per hour. This certainly alludes to the suit’s enhanced agility that triumphs over conventional bulkiness. And interestingly, the scientists are even looking forth to contrive a larger version of this limber contraption that can supposedly carry loads of over 220 lbs. Lastly, coming to the current development status, the Powerloader exoskeleton is being tested out in various Panasonic warehouses in Japan. The human-aiding device is also going through a trial version with Japanese Ministry of Agriculture making use of machine on a few forestry projects. 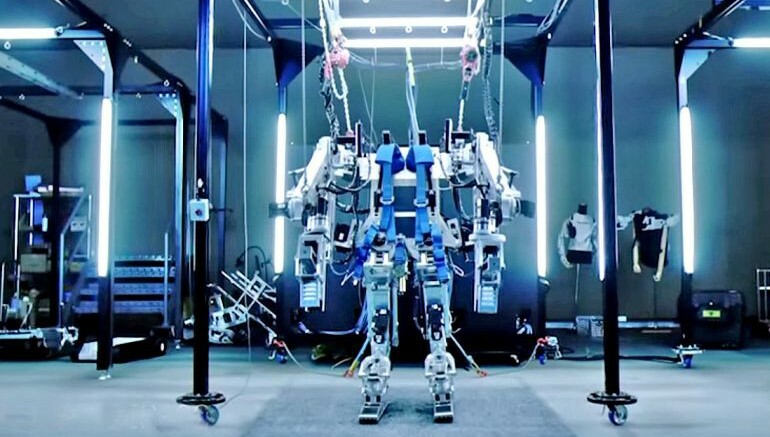 And as a set goal, the researchers are working towards an advanced exoskeleton that can not only lift heavy weights, but also account for improved dexterity that can match up with the natural grace of humans.